Castiel finds himself in the Empty. Cosmic Entity: You see, before God and Amara, creation, destruction, Heaven, Hell, your precious little Earth, what was there? Cosmic Entity: Yes. That's right. Nothing. Nothing but Empty. And you are soaking in it. Angels and demons, you all come here when you die. Before the Universe and even God and the Darkness, there was only the Empty, an infinite black void. The Empty appears to exist outside of creation, and is the final resting place of angels and demons, who slumber peacefully in the vast nothingness. A Cosmic Entity appears to preside over the Empty, sleeping alongside the angels and demons. The rare act of waking up inside the Empty will also jostle the Cosmic Entity from its slumber, forcing it to remain awake for as long as the angel or demon remains conscious and within the Empty. According to the Cosmic Entity, it is the only being that has any influence in the Empty, even surpassing God's will. The Empty is first referenced by the reaper Billie, when she is delivering a message to Sam regarding his and Dean's place after the death of Death. She states that nothing is able to come back from it, which is eventually disproven when a Cosmic Entity residing in the Empty revives Castiel and sends him back to Earth. While Sam is investigating the rabid infection in Superior, Nebraska, he is visited by Billie, a reaper who has a message to deliver to Sam and Dean. She tells Sam that for their roles in Death's death, once they die they will not go to Heaven or Hell, but be thrown into the Empty by the next reaper who comes for them, stressing that she hopes that it is her who does the deed. When Dean kills himself to meet with Billie to get Sam back from the dead, she tells him that the answer will always be "no" to them and that Sam's not dead because if either he or Dean dies, she would know. She tries to take Dean to the Empty, but Dean is revived by Dr. Kessler, forcing Billie to leave. As Castiel's body lays motionless in a black void, he is jostled to consciousness upon hearing Jack whisper his name. 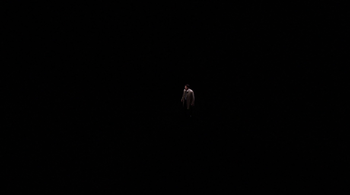 Castiel picks himself up in a confused haze and looks out upon the infinite emptiness he has found himself in. The Cosmic Entity questions Castiel in the Empty. Castiel wanders around the Empty looking for anyone, inadvertently awakening the Cosmic Entity from its slumber. The Entity takes on Castiel's form and speaks in a eloquent voice, telling Castiel that its true form would drive him mad and explaining the purpose of the Empty to Castiel. The Entity reveals that the Empty is the final resting place of all angels and demons, where they peacefully sleep in an eternal slumber. This prompts the Entity to question why Castiel is awake and complain that it cannot go back to sleep until Castiel does. 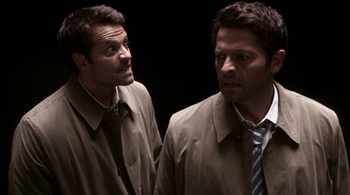 The Entity tries to convince Castiel to go back to sleep rather than return to Earth and face everything he's done. However, Castiel steadfastly keeps his resolve and threatens to keep them awake for all eternity, driving them both insane, until it sends him back to Earth. Realizing its threats of throwing Castiel deeper into the Empty and its beatings will not work on the angel, the Cosmic Entity appears to accept the deal and sends Castiel back to Earth. After greeting a revived Castiel, Sam and Dean are perplexed as to how he is back. Castiel tells them that he was in the Empty and that he annoyed an ancient cosmic being so much that he was revived. He tells them what the Empty looked like, its purpose as the final resting place for angels and demons when they die, and how he was awakened by hearing someone call his name. They eventually discover that since God has no influence in the Empty, it was Jack Kline who called out to him and inadvertently brought him back to life. A distraught Nick prays to Lucifer after killing Frank Kellogg. His prayers to be with Lucifer again cause something to rise up from the black viscous void, taking the form of a skeletal figure with glowing red eyes. The Cosmic Entity invades Heaven to drag the recently deceased Jack Kline into the Empty. The remaining angels send a distress signal through angel radio, prompting Castiel to respond. The Entity appears as a liquid mass of black ooze that chases after Jack through the corridors of Heaven and possesses the angels Naomi and Dumah. When the Entity, in the form of Dumah, locates Jack in Kelly Kline's heaven, it tells him that he's going to the Empty which is "worse than Hell because at least Hell is 'something.'" After a brief battle, Castiel makes a deal with the Entity to take Jack's place. The Entity accepts, but it decides to let Castiel continue living his life until the moment he's truly happy as it wants him to suffer for awakening it from its slumber. It releases Dumah and disappears into a nearby vent, retreating to the Empty. Nick reveals to Sam that Lucifer is awake in the Empty and Nick was able to communicate with him through Donatello Redfield. Using Jack Kline's blood, Nick performs a spell which opens a portal to the Empty from which Lucifer emerges, still in the black viscous form he had in the Empty. Before Lucifer can repossess Nick, Jack intervenes, kills Nick, and sends Lucifer back to the Empty, closing the portal in the process. The concept of the Empty is reminiscent of Sheol, which the Hebrew Bible describes as a place of stillness and darkness, cut off from life and God, where both the righteous and the wicked go upon death.